The continent of Antarctica is a land of complexity and paradox, especially when talking about climate change. It is our driest and coldest desert on the planet but locks up an enormous amount of fresh water in it's thick ice sheets. The southern ocean surrounds the continent, insulating it from warmer latitudes, but those currents also bring warmer waters from the tropics to interact with the giant ice shelves around the continent. And of course there is the paradox of Antarctic sea ice which is recording record sea ice extent over recent years due to the complex winds, currents and dynamics of melt water. Sea ice growth or melt does not affect sea level rise. We need to look at what the great Ice sheets are doing to determine whether they are accelerating mass loss and contributing to sea level rise. The GRACE satellites provide us with a remote measuring tool for ice mass balance, but like all tools it comes with certain biases built in. The job of the scientist is to analyse and correct for these biases. 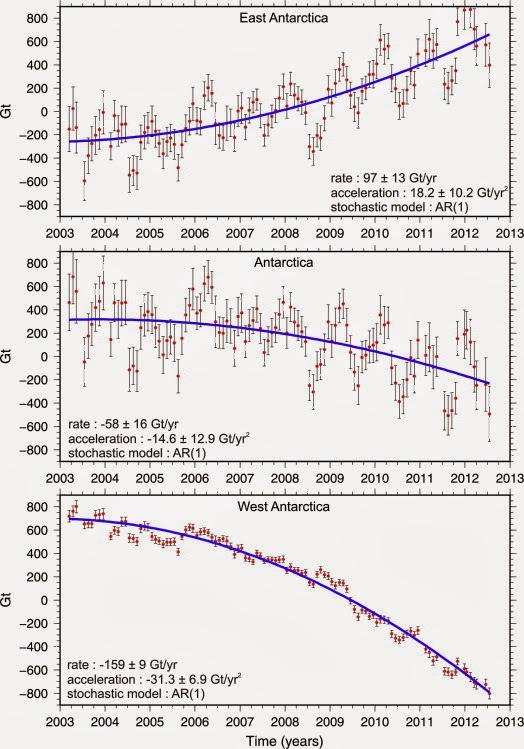 The latest reassessment of GRACE data shows that Antarctica in total is losing net mass at an accelerating rate. However, there is snow accumulation on the high plateau of East Antarctica showing a net gain, while this is more than compensated by ice loss from West Antarctica. "Despite the higher uncertainties, we find significant (2-sigma) accelerations over much of West Antarctica (overall increasing mass loss) and Dronning Maud Land (increasing mass gain) as well as a marginally significant acceleration for the ice sheet as a whole (increasing mass loss)." Fig. 5. - Time series of ice mass changes for the (top) East, (middle) whole and (bottom) West Antarctic Ice Sheet estimated from GRACE RL05 solutions for 2003 to 2012. The optimal functional model chosen using BIC and including an optimal stochastic model of time-correlations is shown in blue. "Over March 2003 to July 2012, East and West Antarctica ice mass change was +97 ± 13 and −159 ± 9 Gt/yr, respectively, with accelerations +18 ± 10 and −31 ± 7 Gt/yr2 , respectively (2-sigma uncertainties) not considering GIA model error bounds. Mass change for the entire Antarctic Ice Sheet is also best modeled with a linear plus acceleration functional model and a stochastic model that considers temporal correlations, giving an ice mass trend of −58 ± 16 Gt/yr and an acceleration of −15 ± 13 Gt/yr2 ." Accurate data measurements of ice mass loss via laboriously estimating mass input and output has only been available since the early 1990s, and accurate satellite measurements (Gravimetry) via the GRACE satellites since 2000. 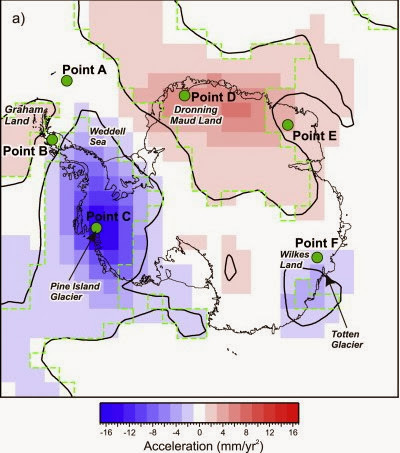 "that Pine Island Glacier’s grounding line is probably engaged in an unstable 40 km retreat. The associated mass loss increases substantially over the course of our simulations from the average value of 20 Gt yr−1 observed for the 1992–2011 period4, up to and above 100 Gt yr−1, equivalent to 3.5–10 mm eustatic sea-level rise over the following 20 years. Mass loss remains elevated from then on, ranging from 60 to 120 Gt yr−1." Dr Gudmundsson was one of the scientists involved in the study from the UK, France, Finland and China. They used numerical models to describe PIG's current and future behaviour. So just the Pine Island Glacier will raise global sea levels on the order of perhaps 3.5-10mm in the next 20 years. Increased oceanic melting of its ice shelf is thought to have triggered those changes. Observations and numerical modeling reveal large fluctuations in the ocean heat available in the adjacent bay and enhanced sensitivity of ice-shelf melting to water temperatures at intermediate depth, as a seabed ridge blocks the deepest and warmest waters from reaching the thickest ice. Oceanic melting decreased by 50% between January 2010 and 2012, with ocean conditions in 2012 partly attributable to atmospheric forcing associated with a strong La Niña event. Both atmospheric variability and local ice shelf and seabed geometry play fundamental roles in determining the response of the Antarctic Ice Sheet to climate. Meanwhile in Watts Up With That land climate sceptics saw fit to compare my article on Waking the giant: Global Warming in the Weddell Sea, West Antarctic Ice Sheet and sea level rise with the funny 'rabbits ears' shape of sea ice extent and ridicule that Warm ocean currents are projected to melt the Filchner-Ronne Ice Shelf in the Weddell Sea area of Antarctica. I think they may be a sign from Antarctica telling us that we've beat global warming, or at least that the Filchner-Ronne Ice Shelf in the Weddell Sea is safe from collapse for another year.... What do you think? But if they had read my article properly they would have found that this is modelling of ocean currents which would start infiltrating the ice shelf around 2066. Much of the Ice mass loss from Antarctica will come from the destruction of ice shelves from basal melting, which will then allow an acceleration of ice streams presently being held in place by the ice shelves. The retreat of grounding lines of ice shelves, due to the dropping away of the sea floor in a substantial below sea level depression reaching depths of up to 2000m under much of West Antarctica, will also exacerbate basal melting and ice sheet instability. We have already seen some spectacular ice shelf destruction and warming on the Antarctic peninsula like the Wilkins ice bridge collapse. Even celebrated naturalist and broadcaster David Attenborough warned of ice shelf destruction in Antarctica and it's impacts. So rather than argue the scientific point about the inherent instability of ice shelves and the West Antarctic ice sheet with warming ocean currents and rising general ocean heat content, most of their post highlighted the record Antarctic ice extent which has been growing slowly in recent years. It is a form of cherry picking in which they concentrate attention on an anomalous fact to distract from the principle issue of accelerating Antarctic ice mass loss which raises sea levels. Images from Simon D.P. Williams et al 2014. Lead image caption: Fig. 1. - Estimated accelerations and trends of ice mass change in mm of equivalent water height on a 500 km regular grid. (a) Estimated accelerations. Black contours indicate regions where the acceleration term is significant at the 2 sigma level. Green contours indicate regions where the acceleration term in the functional model is allowed according to the BIC criteria.